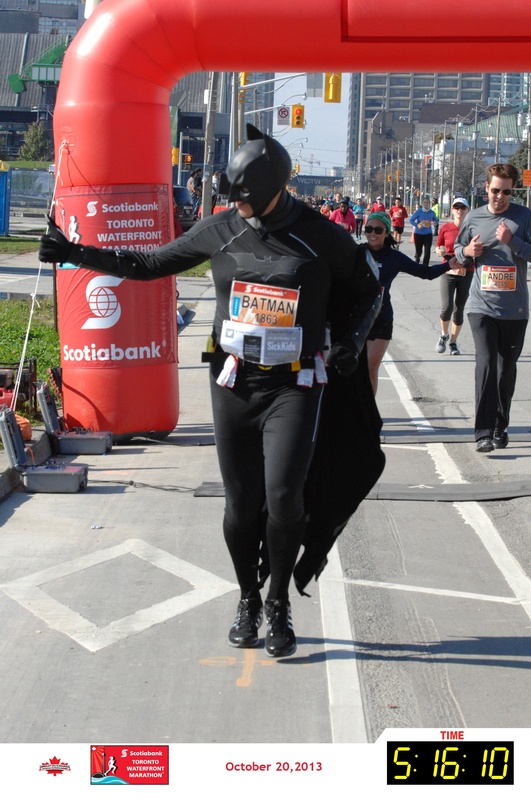 Since 2013, it’s been my honour, privilege and joy to be Toronto’s running Batman. The organizations I’ve run for, the people I’ve met – it’s something I never imagined I’d get a chance to do. However, all good things must come to an end when the time is right. It’s why, at least for an indefinite period of time, I’ve decided to step away from running marathons dressed as The Dark Knight Runner. Recently, I raced the Mississauga Marathon and finished in a time of 4:02 , crushing my previous best by 46 minutes. That feat trimmed my plan to qualify for the Boston Marathon by two years. It’s certainly not something I expected to accomplish, but I want to continue the momentum I have from all the training I put in. This is why I feel the time is right to focus on my personal goals as a runner. Of course, I’m not say goodbye to “Batman” forever (movie fans – see what I did there?). Dressing up in the costume has completely changed my life; in addition to all the amazing people I now call my friends, it’s been the opportunities to be an ambassador for many races in our city, and to the commitment I’ve made to being a better person because of the responsibility as the character. I’m far from perfect, but it’s always been about progressing forward that makes the journey on this road called life interesting. I will never forget all the moments I’ve enjoyed wearing the cape and cowl. So, what am I planning for my final marathon in costume? Anyone who knows me knows that I don’t do things easy. Therefore, I’ve have decided to add a few extra kilometres to my route – eight, in fact. I will run from High Park to the starting line, thereby running a total of 50k on October 22, 2017. 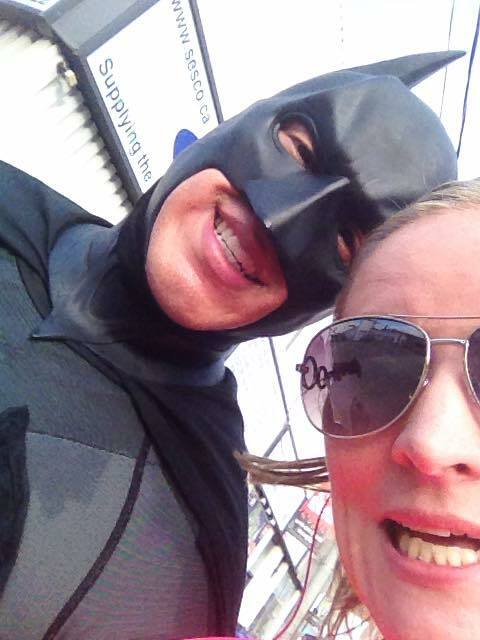 That’s 10k for each season I’ve run dressed as Batman, and there are plans for my team the Justice League Runners and I to fund raise for Skylark Children, Youth and Families, one of many official charities for the race. I could very well be back for a full marathon in my costume one day; in the meantime, I will definitely join my team for the occasional 5-10k race in and around our beautiful province, as well as participate as a race marshal for kid’s runs in and around Toronto. Does Batman really have to say goodbye? 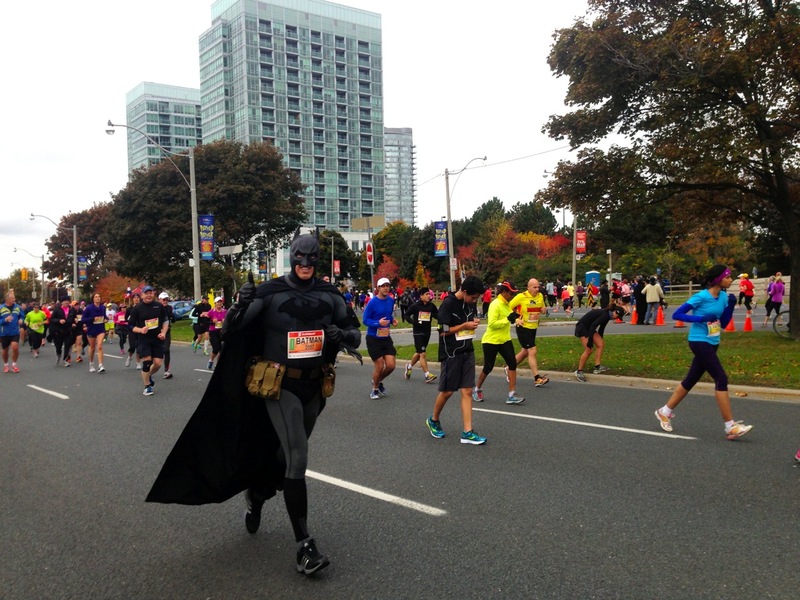 Here’s what I’m thinking – how about someone out there reading this right now…carry on asthe new Toronto running Batman? Why not? “The idea was to be a symbol; Batman could be anyone”, said Christian Bale in ‘The Dark Knight Rises’, and that is so true about what I’ve done in my time as Batman. I would really love to see that perhaps someone else carry on what was started; that it doesn’t matter who they are – it’s what they do that defines them. That was 2015 for me. My over-all goal was to (FINALLY) run my first marathon without the costume. The long term goal is to run the Boston Marathon and with this in mind, I’ve realized running in a cape and cowl won’t get me closer to my qualifying time. So, the time has come to shape up and get real. Race #1 – Harry’s Spring Run Off. Dominated. 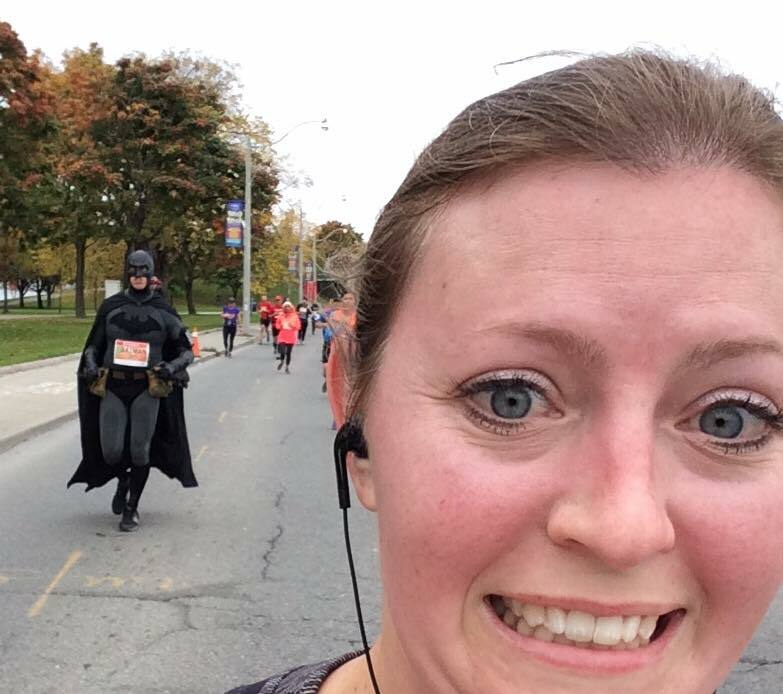 Best 8k I’ve ever run, and that was because I dressed up as ‘Bruce Wayne’ (Bruce Wayne…get it?). Never thought I’d run in a shirt and tie and have fun doing it. A beautiful, cool and sunny day where I finally finished up High Park’s famous hills and finished strong. We’re off to a good start, 2015. Next up, the Toronto Yonge Street 10K with my team, The Justice League Runners! 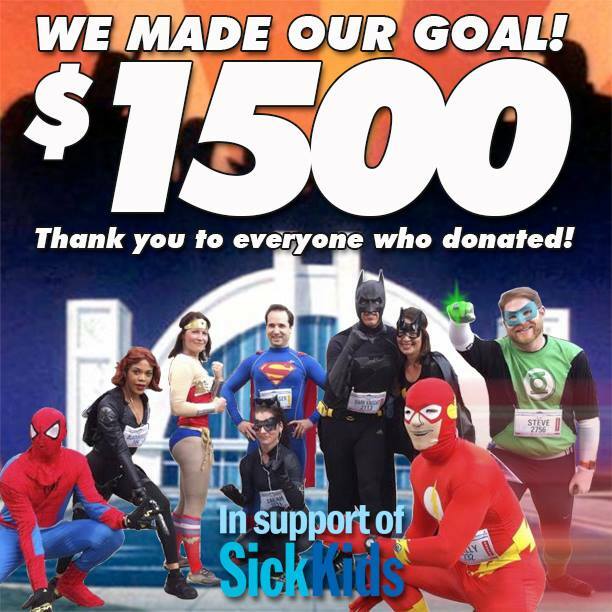 First off, we doubled in new member from the 2014 squad because so many new running friends wanted to help our charity of choice, the SickKids Foundation, and that half the team was made up of female super heroes. I’m very proud that there was a larger presence this year. I believe in inspiring the younger generation, so the bonus of having more girl power contribute to the JLR helps drive the message home. Supergirl, Batwoman, Batgirl, Lady Green Lantern, Wonder Woman, Zatanna, Robin – from the bottom of my hear, thank you so much. On that note, there is one thing that can be said about the power of a superhero’s logo – it can mean so much to someone at any given moment. A simple wave hello, a high five, stopping for a photo, words of encouragement – these are small yet simple gestures that can brighten ANYONE’s day, be it a spectator or runner. Any of these actions don’t require a cape – they can happen anytime. Our world needs more of that more than ever. As much as it was a blast to promote TYS10K, my time was just stretched too far to allow me to be mentally ready for a spring marathon, so I had to bow out of Mississauga. Ask any runner – the real marathon starts after the 30k mark, where you need your brain working for you. I was just mentally spent. But looking back, I would not trade it for anything – the JLR created something magical for SickKids, and that meant more to me than anything. I was okay with not running a spring marathon; I will get that chance to earn my spot in Boston very soon. 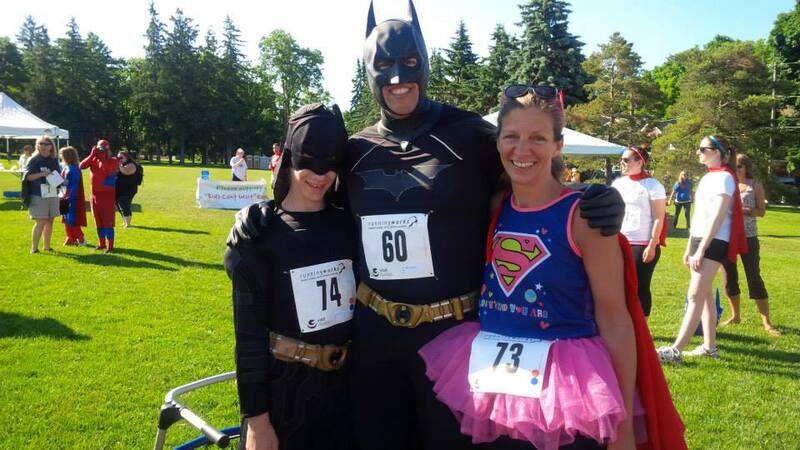 A few more appearances as The Dark Knight Runner would follow after at some smaller races in Ontario, one of them being my favourite 5k, the Kidsability Superhero 5k in Guelph (if you ever want to see the cutest kids dressed as superheroes, DO THIS RACE!). These races would be key to balancing things; just have fun what you love doing. By August, my mileage for the year hit around 1500k, and I felt I needed to step it up. All this running going on, and I’m already working 60 hour work weeks (insane). One fine Saturday morning, I joined my pals Green Lantern and Superman for what was suppose to be a pretty easy-going 34-36k training run. We started out near Taylor Creek Park by Main Station. Things were going really well for the first 3-4k; cracking jokes, laughing it up, running. Nothing could go wrong. We approached a rock that is only a foot and a half high. I think to myself, “Oh, I so got this – I’m Batman!” I jumped and the first mistake occurs – the take off. I didn’t leverage myself to get good enough height to even pass over 10 inches high; that resulted in colliding with the rock, attempting to land on my left foot but rolling and landing on it hard on the outside of it with my full weight of 210lbs coming right down right behind it. Oddly enough, it didn’t hurt right away, but man I sure felt it. I opted to continue running, despite my friends objections. However, I paid a price for that (really, what was I thinking going an extra 4-5k?). I couldn’t go anymore but was able to get to the subway to head home and still try to go to work. I felt brave enough to be able to handle work tasks, so that’s why I still went. Another decision I am questioning to this day. Pain – nothing but pain, and I still tried to tough it out. However, my coworkers convinced me to go to the hospital, and after checking into the ER, waiting to take an X-Ray and for the results, I got news that was really scary – a hairline crack of the bone just below the ankle, out 6-8 weeks. F***. However, right from the start I was determined not to let this sidetrack me. As soon as I got the news, my mind shifted to “What do I need to do to get back?” I made a promise – to my family & friends, to my teammates on the JLR and just as important, to the SickKids Foundation. I didn’t want to fall trap to the thinking of “why me?” I soon realized that, as bad of a spot I was in, it wasn’t going to be the end of the world. I knew I would be back very soon. I would return to run STWM – there was no option. One work colleague said that perhaps I was willing myself to heal, and I believe that to be true. The mind is a powerful tool in all aspects of your life; it can derail you, if you let it. But it is also your most powerful ally; this is so true: “Whether you think you can or think you can’t, you’re right.” Six weeks after getting hurt, then being in a cast, then an air boot for support plus a prescription of swimming and bicycling to help improve strength and motion, I was back on my feet running again. I just refused to be stopped. To sum it up – magical and inspiring. The start line stands out – our long walk to the back of the pack. The smiles, the whispers, the high fives – yeah, the Justice League Runners sure know how to make an entrance! Now, we split the team into two – one team would tackle the half distance, while four poor souls (myself, Superman, Green Lantern and Thor) would do the full 42.2k. As a team, we did our absolute best to keep the crowd and runners smiling and engaged as we headed out of the starting line (You can bet that there has never been a group of folks dressed as superheroes singing “500 Miles” by The Proclaimers in a race – guaranteed!). We wanted the mood to be a fun one; we even became an impromptu cheer station by the CNE along Lakeshore Blvd (and that’s thanks to me. Hey JLR, the guy in the Port-A-Potty took forever, what did you want me to do? Hehehe…). As we made the split at the halfway point, my foot was holding up just fine. In fact, aside from a little light soreness (which was to be expected), there was nothing bothering me. Thor, Superman, Green Lantern and I were just moving along, taking some walk breaks as need but over-all, enjoying the experience. 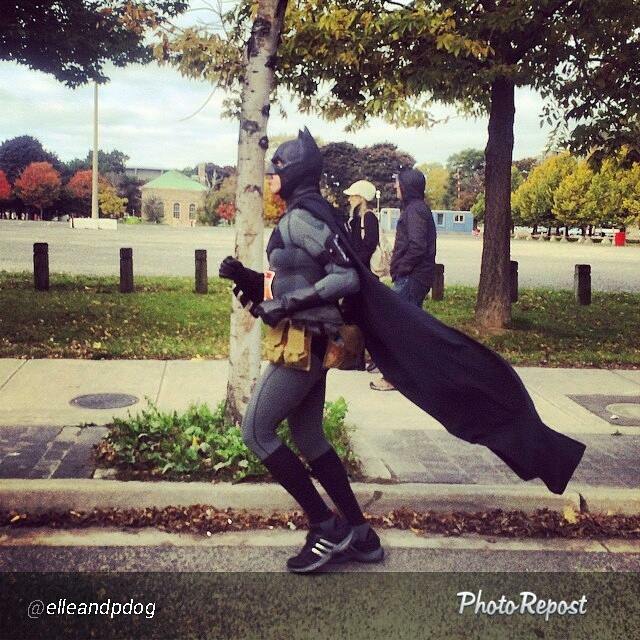 And you thought yours truly was insane running in a rubber Bat cowl, right? JP was joined by a mutual friend of ours, Athena, who herself is a survivor of sexual assault. I truly admire her – she was returning from running not long after what happened to her while on a training run. It angered me to know that something such as this happened to a close friend of mine, but seeing her at the race, overcoming it, with JP truly gave me the vision of what it means to be brave, courageous and stronger than the evil in this world. Sometimes, running a race isn’t just about the time you’re trying to aim for; sometimes it’s about coming back from what you once thought you couldn’t. It doesn’t hurt to have company that helps you out in the process. While on the course the six of us certainly entertained each other with jokes and stories, nothing that can be repeated here but I was certainly it all. Being able to cross the finish line with not only my super friends but with Athena and JP is truly the single greatest moment in my running career. I will never forget JP telling Athena that he would not cross the finish line without her hand in his, raised in victory. Witnessing that moment while living it is etched in my memory; I saw two people look at horror in the eye and tell it “You will never keep me down – you will never beat me.” I’ve never seen that before in my whole life. I’m still inspired by the photo finish we shared. So, that was 2015 for me. A lot of realizing that you really have to have balance and be truly prepared for the unexpected, but rediscovering & finding inspiration. In the weeks since STWM, I have actually allowed myself to step back and take a breath. I did this because in the past I would carry on with hard training and not want to lose what I worked so hard to gain. However, now I’ve realized that I will never allow myself to stop running; I will be in better tune with my mind and body to strike the balance that I need in order to continue to grow mentally and physically. I will come back reinvigorated and ready for the next challenge – continuing to help others who can’t help themselves. 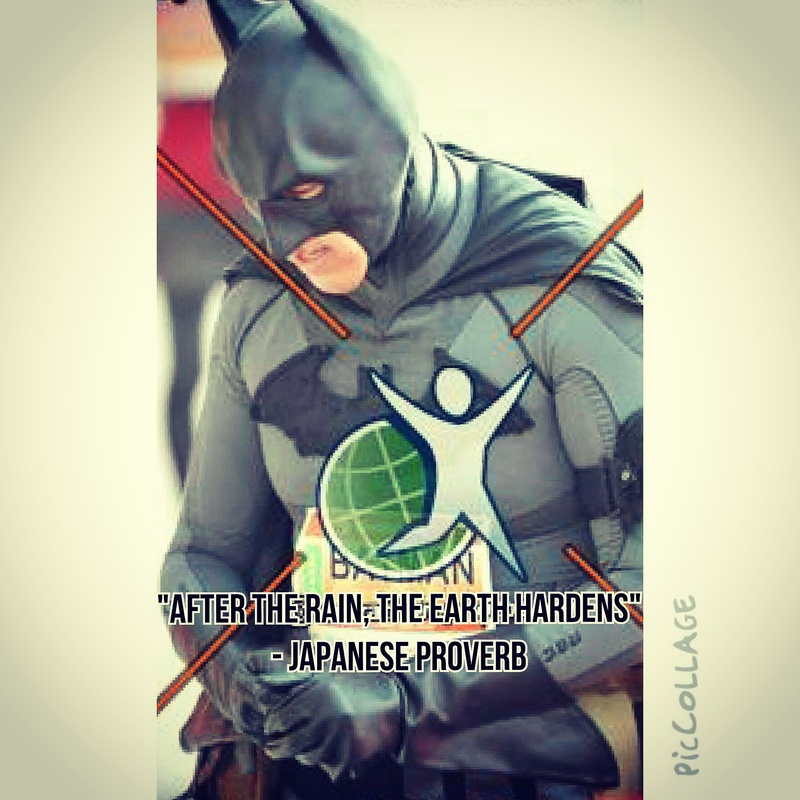 I won’t stop being The Dark Knight Runner, and if I could help everyone I would. For now, I’ll just keep doing my part to help as much as I can, along with my team – one race at a time. This is a post that has been sitting in my drafts folder since last July. I think it’s okay to share this with the world now. July 19, 2014 was a day for a very personal victory for me; I didn’t realize I would be facing phobias that I’ve suppressed while competing in the 2014 Warrior Dash at Horseshoe Valley in Barrie, Ontario. With each obstacle finished, I whispered to myself ‘claimed’, because I took back a little piece of myself away from fear that use to grip me. It took us, my son & I, one hour & 20 minutes to finish, with mud kicked in my eye (literally), climbing hills, walls, under barbwire & over fire… and loving every minute of it. My training for marathons and other races learned a lesson today – danger is real, but fear is a choice. Music is such an integral part of many athlete’s mental performance for their respective sport. It can transcend them into ‘the Zone’ – that space where one’s belief in themselves rises, where the impossible becomes the possible and in many cases helps others raise their game to a place where they’ve never been to before. I have always needed music to help me raise my game – to allow my mind to dive into the mental reserves that I have forged with the help of motivating tunes. From when I was a tween (many moons ago, I was a tween?!) trying to make my respective school teams, to being a hockey goalie for over 20 years and needing that mental edge to keep my team in the game. The lyrics in music is absolute to me – if it speaks to my heart, then it’s message is one that I want told to me again and again. What makes the music that we use to listen to while training is that it speaks to us – it doesn’t have to be understood by others. There was something that resonated with you when you first heard it, be it the lyrics, the drums, whatever – a genre of music touched you at the very core and because of that it is personal, it means something to you. Whatever it is you listen to – jazz, pop, techno, rap, hip hop, country – I encourage you to use what it is that motivates you. However, please mind your surroundings if you do run with headphones, and I would leave them at home when you’re with your running crew and tribe (s’up, Night Terrors Run Crew & Tribe Fitness!) The company you keep can help push you to new heights, too! Every time. I. Watch. It. The drums – powerful and heroic. I connect with this tune but for nostalgic reasons: the moment he flies so powerfully, I am sent back in time to when I was a little boy, planking myself on my mother’s couch and ‘flying’. When this tune comes on at the tail end of a training session, you can bet that I am pushing myself to finish strong, to a place where I feel ‘super’ and free, and nearly every time in the final 100 metres of a race, and this tune pops into my mind, I’m giving it everything I’ve got, connecting me with my childhood, and reminding me of how I use to soar like Superman. What about you? What are some of your favourite running tunes that push you out of your comfort zone? A line from the 2005 film ‘Batman Begins, and at this point in the film Bruce Wayne has already begun his career as the Batman, so it’s obviously meant to steer any possible indication that he’s the Dark Knight. It’s a line that I remember had me chuckling, thinking to myself “good point.” Funny how time and chance would lead me to be in a similar situation 8 years later. 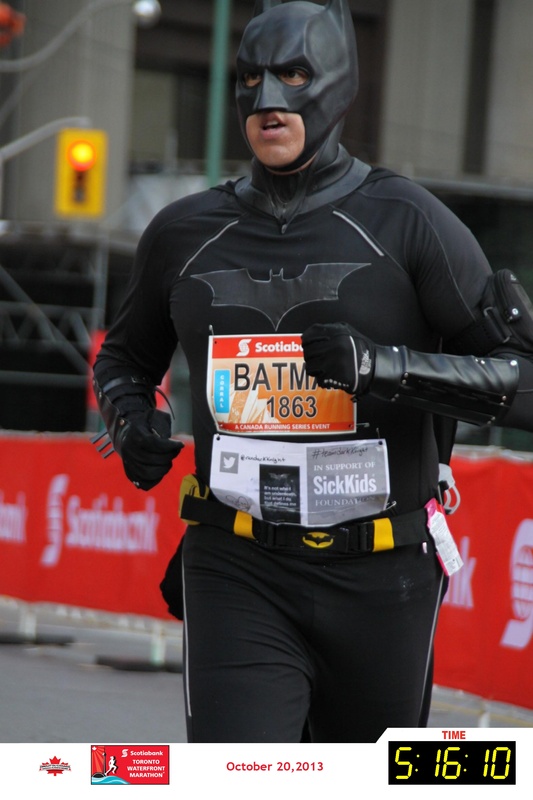 I won’t recite my full story; I was fortunate to have had some media coverage through TV and print, but for those who don’t know: I ran the 2013 Scotiabank Toronto Waterfront Marathon dressed as Batman, to not only say thank you to the Hospital for Sick Children in Toronto for saving my life 30 years earlier when my appendix ruptured but to help raise funds for the SickKids Foundation for those children who are there right now fighting their own battles (and fighting them very bravely, I might add). My belief is that super heroes are among the best icons we can use to symbolize the potential and hope that I see in humanity, that we all can be a force for good. 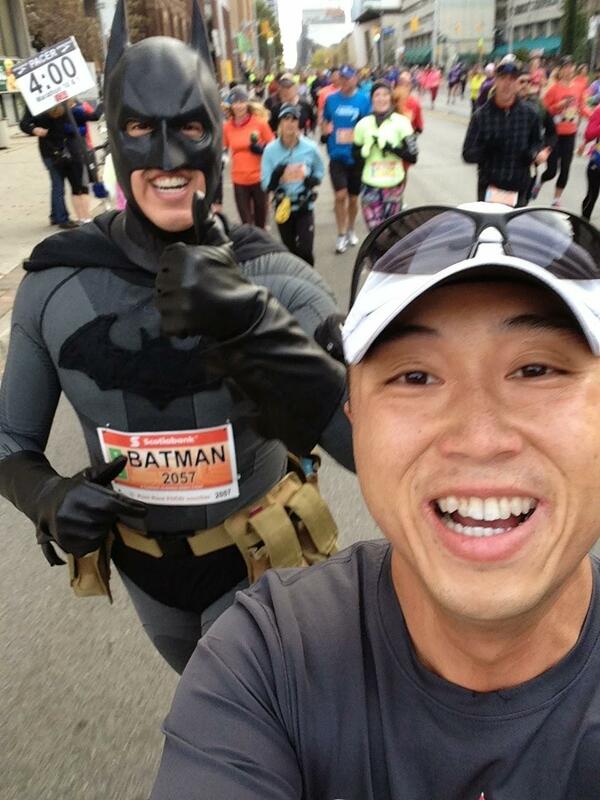 I wanted to brighten the day of the crowd on race day, simply the sight of Batman running a marathon. From there, the ball really got rolling – through Twitter and Facebook, a team was formed by interested runners who wanted to help further raise funds, and this team would be called ‘The Justice League Runners’ (ironically – I once told my parents that I would one day be a member of the Justice League). In April, 9 members of the JLR ran the Toronto Yonge Street 10k to help support the SickKids Foundation. That’s when it hit me – the power of social media and what can be done when people connect for a common cause and goal; it still leaves me in awe. As a group, we surpassed our goal of raising $1500 for the foundation; that was truly, truly amazing. I am now proud to call all these wonderful people my friends and apart of my extended family. Little did I know, that would be the start of a year filled with running (and lots of it) and the best part – making new friends. Over the course of the spring, Batman was called upon on two more occasions to run (and sweat) for the greater good; there was the GoodLife Half-Marathon in May (which was challenging because I came down with a cold and cough two days before but didn’t want to let people down with a DNF – “Did Not Finish”), and the other race I went to (which turned out to be a favourite of mine) was a nicely titled course called the “KidsAbility Superhero 5K Run”. I was sent a kind invitation from a young lady named Deirdre (@dela_2012) who follows me on Twitter (there’s that social media thing again!). 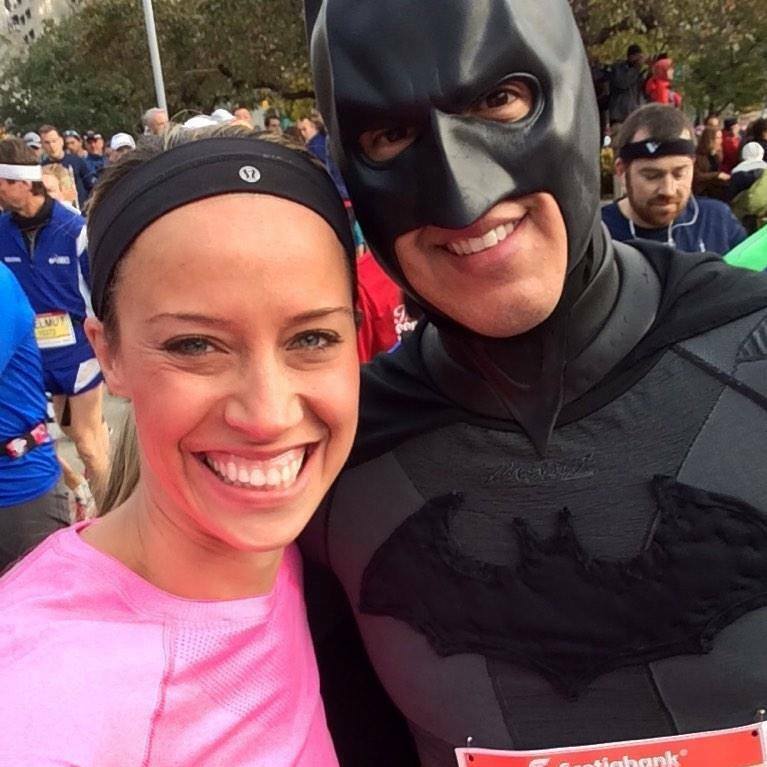 It was literally a race full of people dressed as any hero you can think of – Superman, Batman, Spider-Man, the Hulk, and more. If I had forgotten what the symbol of a super hero can mean, I was given a wonderful reminder on that day in June. This race was practically a dream come true for me – parents, their children and other runners converging in unison with a desire to help, using the positive message that super heroes can give. That race, it’s organizers, the participants and the volunteers will always have a special place in my heart; thank you Deirdre, Graydon and everyone associated with the KidsAbility Superhero run. I can not wait to see you all again in 2015! My goal race for 2014 was a familiar one – the Scotiabank Toronto Waterfront Marathon, but this time I wanted to be faster, and stand out more. 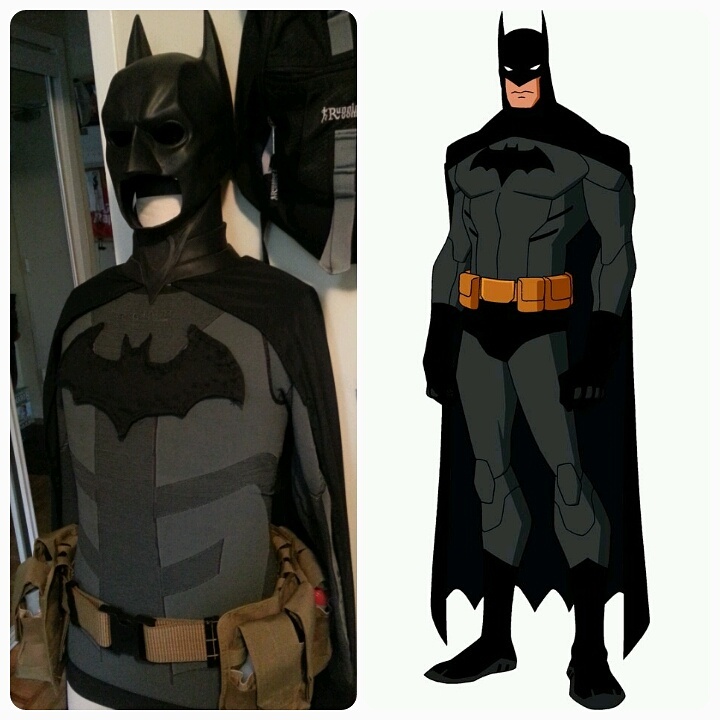 And just like Batman, I needed to take it up a notch, and that required me to do two things: up my training over last year and work on some mechanics, and (the one that was more fun) come back with a new Batsuit. Yes, that is a nylon military-style belt with nylon pouches that wrapped around my waist, that would hold 8 flasks for my hydration and gels. Was it as hard as it looked? Yes. Do I regret it? Not one bit. Why? Again, I remind you of those for whom I’m run for – the kids at the Hospital for Sick Children, who are battling unspeakable illnesses with bravery and super-human strength. Surely, if they can do that, then I can endure something like running for 42.2K with added weight. So, the big day arrives – time to get this done! I will admit one thing that is really a cool feeling – stepping out of a building, in costume, and seeing the first child you see and his/her eyes light up with astonishment and surprise, and you can just read what their lips have said…”Batman”. Within seconds of stepping out of the building where I changed, I can hear cameras shuttering, and little kids (and their parents) saying “Go Batman”. As I approach my corral I’m approached by runners, spectators and running friends (with whom I’ve trained with) alike offering words of encouragement and asking to selfies. I get a great rush out of the start, and try to encourage everyone as I can to just simply do their best and everything else will take care of itself. Then the gun goes off, and it’s time! The elites are the first to go – then off we go for the time of our lives! 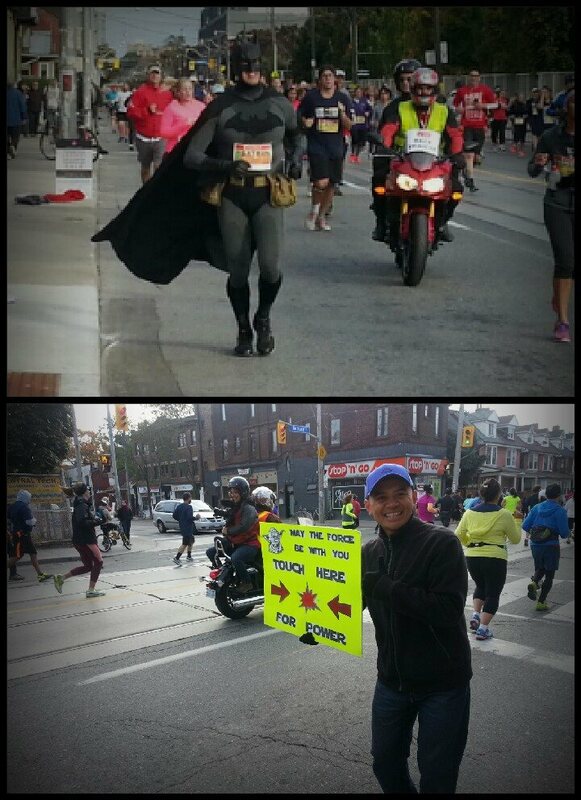 While running along the route as Batman, the one thing I try to do for every race (and I guess if there is one rule for costume running) is that I always make time for the spectators and volunteers who’ve come out on their free time to cheer and help EVERYONE, and not just me. We runners build a network of support from our fellow running colleagues, family and non-running friends (who think we’re nuts), but it makes such a huge difference when a stranger is shouting your name to keep pressing on, especially when the going gets tough around the 34k mark. I don’t know; I’m not the authority on costume running, but I do my best to say hello and thank everyone, no matter what stage of the race I am at. I will wave as often as possible, no matter if my arms are tired. 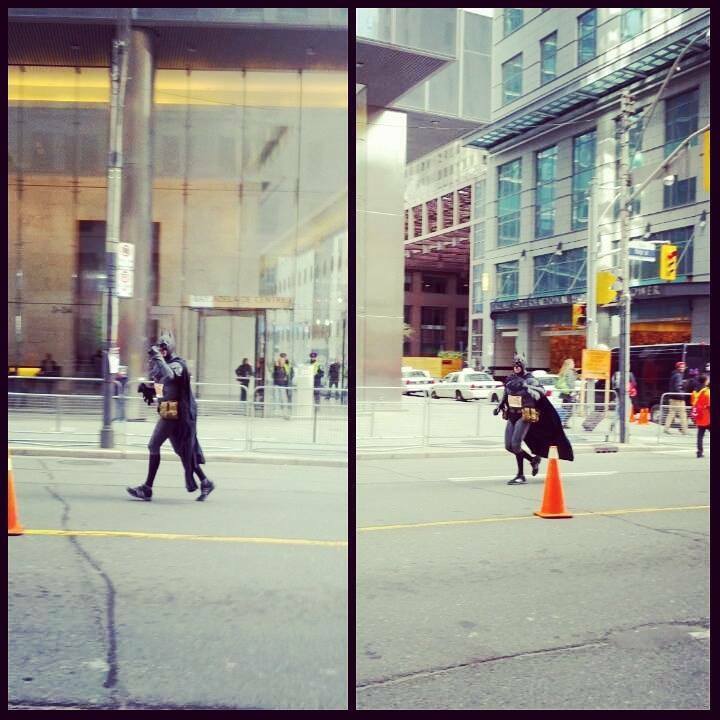 That’s why the Dark Knight Runner belongs to the citizens of Toronto. Was there a moment where I was in pain, given what I had on? Yes, there was – it happened as I approached the Eastern Avenue bridge. I think that was the 34k mark; I was done. Unfortunately by the 8k mark, my hip was in pain, and not long after both my calves sore. As I got to the bridge, I couldn’t run it anymore. I told myself “It’s okay – you’ve given it your best.” In other words, I was telling myself that it was okay to quit before the task was complete. In this moment, I was getting angry with myself, because I felt like I was going to let the SickKids Foundation down. I would have never been able to forgive myself if I quit – this moment of pain would be worth a lifetime of glory (a quote from the film ‘Unbroken’). So – I put one foot in front of the other, and I finished the marathon, and with a faster time than the previous year – 5:05. Another thought was captured at the finish line, one that had pain on my face, but in my mind I was telling myself “No regrets – period”. No regrets. None. This has been truly a year I pray I will never forget. I’ve met wonderful new running friends (super friends, if you will) while further engaging with those I’ve known for some time, set and surpassed my goals and expectations, and ran more than I ever have my whole life (as of December 24, I surpassed 2014k in 2014) while doing my best to help inspire a city, because I was inspired. So many people to thank – the clinic instructors at the High Park Running Room (Chris M. & Chris H., Sandy & Paul), Tribe Fitness (led by Heather G.), Night Terrors Run Crew (Toronto leader Bill C.), but most of all, my kids and grandkids – Violeta, Ben, Noah and Selena. You four – at the heart of it, you are the reason I put on that cowl and cape, so that I leave you with something by example. I can’t leave you a fortune – the richness of helping others and doing your part to help make the world a little better is the gift that money cannot put a price on. I love you all. Thank you for taking the time from your busy day to read my story. I think with all I did this year, I could fill a volume; there are big things planned for 2015 – the Justice League Runners will be back at the Toronto Yonge Street 10k with current and new members, and there are plans to establish a world record for the fastest marathon run by a group dressed as superheroes at the 2015 Scotiabank Toronto Waterfront Marathon. Always remember – it’s not who you are underneath, but what you do that defines you. 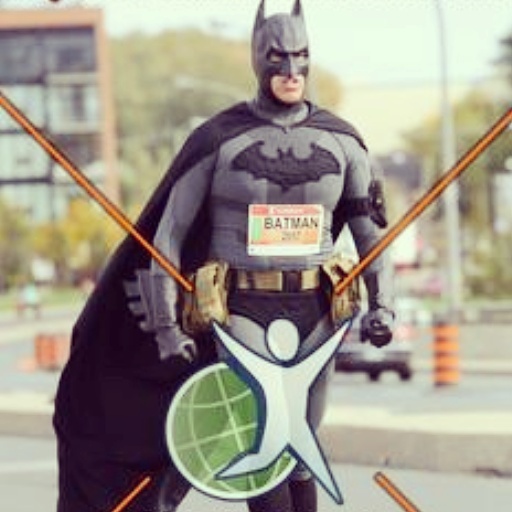 That’s what I told myself when I decided to embark on a tiny little mission – to run and complete a full marathon, for charity, dressed as the greatest detective in the comic book world, Batman. And it filled me with great happiness that I would do it with a mask on – because it was not going to be about the man who’s face is seen by the crowd, but that of the symbol for which the ‘Bat’ stood for – to rise above adversity and to inspire. My initial inspiration – to say thank you to the Hospital for Sick Children in downtown Toronto. What continued to drive me? The true brave and everyday heroes – the young boys and girls who day in and day out endure a battle that no child should ever have to go through; clearly, running 42.2K doesn’t even compare to their long journey. So, I decided to run, and to hope that I could inspire others around me – my family, my friends, and the crowd who would be cheering on over 25,000 runners on a sunny October morning in 2013. I’ll post the journey that I’m about to embark for the next 12 months, all the way to October 19, 2014 – the annual Scotiabank Toronto Waterfron Marathon, as my team and I run for those that inspire us.